Two men have been remanded in custody after appearing at Ballymena Magistrates Court on charges relating to an investigation into a robbery and burglaries carried out in the Ballymena and Larne areas in June this year. 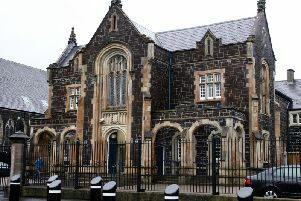 The incidents happened between June 13 and 17 and in the dock were Ryan Robert Connor (36), of Mill House, Priory Gardens, Larne, and Javin McClure (22), with an address at Condiere Terrace in Connor village. Ryan Connor has been charged with robbery, attempted burglary, burglary, theft, fraud by false representation, handling stolen goods and assault occasioning actual bodily harm. Both men are charged with robbing a man of car keys and a car on June 17 this year and with assaulting him occasioning him actual bodily harm. They are also both charged with burglary at Brustin Lee at Ballygalley, with intent to steal to steal on the same date. Both men are jointly charged with handling stolen goods - a Volkswagen Golf - on June 19. Connor is further charged with burglary with intent to steal by entering an outhouse at Ballycowan Road at Cromkill near Ballymena on June 13. On the same date he is charged with the theft of £250 cash belonging to Santander; and also on June 13 - fraud by false representation by topping up a mobile phone using a credit card with the intention of causing a loss to a female. McClure is further charged with attempted burglary with intent to steal by entering a garage at Killyglen Road, Larne, on June 16. Both accused were in handcuffs when brought into the dock at Ballymena Court. A police officer believed he could connect them to the charges. There were no applications for bail and both men were remanded in custody to appear back at court on January 4.